MEDIA ROOTS – In Egypt, street art is quickly painted over and removed from public view. To combat this, photographers have recently teamed up with artists to compile collections for print publication. Since the resignation of President Mubarak last year, artists’ dissent appears to have grown even more angry and primarily focuses frustrations toward newly elected President Morsi. “You are a regime that is frightened by paint brushes and pens,” read one verse recently displayed. “If you were doing the right thing, you would not be afraid of what’s painted.” The Muslim Brotherhood is also a target of the denunciation. Wall Talk is the newly released collection of graffiti displayed in Egypt over much of the past two years and is now available for free download on Scribd. 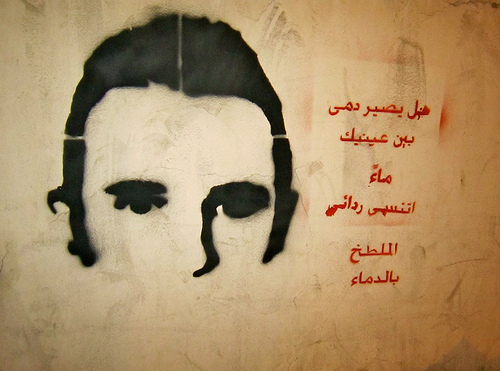 Ottawa Citizen – Wall Talk publisher Sherif Boraie says graffiti was the vehicle that delivered clear, strong and angry messages during the anti-Mubarak uprising and afterward. Now it reflects the depth of frustration over the perceived failure of the revolution to realize its main goals, he said. To read more about how graffiti artists are creatively spreading information in Egypt, read the full article in today’s Ottawa Citizen. Image provided by Flickr user Gigi Ibrahim.